Let's make a cartoon girl that's both cute and friendly just like the image to the right. As usual remember to draw lightly so you can erase your mistakes and guide lines easily when you are finishing up your drawing. Create an egg shape for the head. This isn't your standard egg however - this is more of a cartoon egg. It's quite thick at the bottom and very thin and narrow at the top. Next, draw a rectangle for the body. This rectangle, like the egg shape, should be thicker at the bottom than at the top. We'll use this to create the body of the cartoon girl and her dress. Whoa! It looks like a lot happened between step 1 and step 2, let's examine what you need to draw. Draw a "U" shape that connects the head and that also cuts into the dress - this will make the neck. You'll also notice that the sides of the dress are a little more curved than the original rectangle. The dress should curve outward as it gets to the bottom. Add in Lines for the Arms and legs. If you look closely you can see a little bump on the knee and on the elbow. You don't have to add these details, but I think your cartoon girl drawing will look a little better if you do. Don't worry about the hands and feet for now, just worry about getting arms and legs that are about as long as the ones in the step 2 image. Add in a big smile to your cartoon girl - she's happy! Add another line on the top of the mouth shape for the upper teeth. TIP: When someone smiles you can usually see the upper teeth. Draw two circles for the eyes, and an upside down "U" for the nose. By keeping her face simple we'll make sure that she's as cute as a button! To finish the feet, I used a triangle shape for the cartoon girl's left foot, and another fatter triangle shape for her right foot. Let's keep it simple right? If you wanted to at this point you could add some shoes to her, but for my drawing she is going to be left bare-foot. Her hands are also simple shapes. An easy way to do this is to draw a circle for the main part of the hand, and then draw little spikes coming off of it for the fingers. At the very tip of the finger it's important to remember to make it a little rounded so that your fingers are too pointy. To start create a scrunchie to hold her hair. This is just two little upside down "u" shapes at the top of her egg head. Next create the shape for the hair. It's bushy and thick right where it comes out from the scrunchie, and then goes into a point at the end. You should also add in some lines to indicate the shading of the hair. This should be drawn on the underside of the pony-tail. Next you should add some hair that goes across her face. Create sweeping curve lines that go from the top of her head to just above her ears. You will see that the bigger of the two hair parts has some additional lines. These help make the hair more interesting and give a subtle effect of the hair strands. What's the last detail? It's the ears of course! Use a "C" shape for her right ear, and the round part of a "D" shape for the other. Add in two little curved lines inside of these shapes to finish off the ears of this cartoon girl. That's it for this step-by-step cartoon girl drawing lesson. 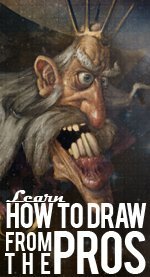 If you struggled a bit with this one go back and try some of the easier tutorials in the step-by-step or cartoon drawing lessons sections of the site. Keep practicing and you're sure to get it in no time!